ALEX McGUIRE is the immediate past president of the Scottish Official Highland Dance Academy. He is a former champion dancer, current judge and well known for his straight shooting, no-nonsense ideas on Highland dancing. This is the first is a new series of interviews with leading lights in the world of Highland dance. CELTIC WORLD: Traditional dancing has certainly grabbed the spotlight these days. Riverdance, Lord of the Dance etc. have obviously propelled Irish dancing to the forefront yet Highland dancing has never quite caught that slipstream. Is there a reason? ALEX McGUIRE: I suppose the success of shows like Riverdance etc, evolved from the public in general, latching-on to a presentation that was crying out to be developed. The visual idea of what seemed for years to be a local Irish style of dance suddenly being augmented by a stage full of what were originally solo dancers all performing as one and accompanied by brilliant Irish folk tunes from top Irish musicians couldn't fail to inspire and excite its audiences. The fact that it was headed by Michael Flatley, whose dynamic personality helped more than anything to elevate the show world-wide, proved once again that a good idea fronted by a good-looking lead dancer was the recipe for spreading the word and plugging Irish dancing to the masses. To try something similar with Highland dancing has been tried by a few groups jumping on the bandwagon (Riverdance a la Celtic) but none have reached the heights of emulating their Irish counterparts. Remember, Riverdance had a good front man to carry the show - a character who stretched the boundaries of his local art and was able to turn what used to be danced at small Irish ceilidhs and concerts into a stage spectacular. To do this re Highland dancing would need someone of the same calibre who could expand the limits of our art and find a financial backer who would have the courage and funds to stage a Celtic similarity - but let's face it, that's exactly what it would be - a type of Riverdance with tartan and backed by accordionists and fiddlers. And who would we get to carry the show? At the moment in the Highland dancing world there is no-one who stands out as a dashing leader as, to tell the truth, no-one has the "courage" to go beyond the confines that today's dancers are limited to. Decades ago we could have taken our pick of "characters" who competed weekly on the games circuit, but nowadays all Highland dancers are ordered to perform like robots and haven't the fortitude necessary to reach a higher level of "breaking the rules" and thinking for themselves. Until then, Highland dancing will remain in the depressing, monotonous state it has been in for the past half century. CELTIC WORLD: Your organisation, SOHDA, has a long history yet in recent years it has been overtaken in the numbers stakes at least by SOBHD. Does that concern you, is there room for both, and how do you feel about the current state? ALEX McGUIRE: Of course the situation concerns us, as it does all the members of the many other free-thinking dancing organisations throughout the world. But when dancers from North America, parts of Australia etc. are brought up with no choice but the SOBHD to join then obviously there numbers are more superior to the other dancing bodies who prefer to maintain their own heritage in styles and steps, which each country takes pride in defending. As for there being room for both, then that is something we have been trying to balance out over the last few decades by attempting to make contact and talking over ideas that would be beneficial to all concerned. But, as I'm sure you will be familiar with, any contact we have attempted is ignored, our letters are very often not answered, and we all know it would be futile as we would be dictatorially informed that there is only the SOBHD way of dancing and no other. So, this only makes us all that more determined to uphold and preserve our own styles and contest this overbearing attitude. CELTIC WORLD: There are subtle differences in the dancing styles of the proponents of both SOBHD and SOHDA, is there room for give and take with both styles,and in the case of a truly open competition just how difficult is it for a judge to evaluate these differing styles? ALEX McGUIRE: As with the previous question, this lack of communication by the SOBHD makes it impossible to discuss styles and steps. It's the old chestnut, you either do it their way or we can forget about a meeting. In fact, one of the few replies we received basically stated that our entire membership should become SOBHD members and only then could we iron out any problems. And as for judging various styles at the Games, the judges of the SOHDA have, over the past decade or so, been intensely learning the styles and dances of countries like New Zealand, Australia, etc. and all are thoroughly competent in judging any style of dancing that appears before them on the dancing platform. Surely a welcome relief for "foreign" dancers when they fulfil their dreams to dance in Scotland, without having to learn a complete new programme of dances for a few weeks' visit. As to SOBHD judges, they are more or less brainwashed into accepting only SOBHD steps from dancers and will often ignore or mark down any dancer who performs anything other than the steps they have been indoctrinated to accept. How's that for an impartial and democratic decision? Furthermore, the current ruling of the SOBHD states that their judging panel (who are considered qualified) cannot sit with an adjudicator outwith the jurisdiction of the SOBHD (who are considered unqualified). However, this particular rule is continually being flouted when you witness judges from the SOHDA and Independents sitting with judges from the SOBHD. This is clearly a case of double standards. CELTIC WORLD: Some say dance is pure art, some say it is a sport because of the aerobic nature and competitiveness, others that it is an amalgam of all; what are your own thoughts on the definition of Highland dancing in the Year 2001. ALEX McGUIRE: Highland dancing is definitely an ART - it always has been and always will be. The idea of it being a sport is due to the fact that today's dancer has easy access to improved training methods, re gyms, work-outs, etc. So, obviously today's dancer will be much fitter and more equipped physically to perform our traditional dances than the dancer of yesteryear who, although unable to reach the fitness standard we have today, was still able to achieve a high level of expertise when competing. So, this new century will see fitter and more powerful dancers capable of sustaining a day's heavy competition. But, all the exercising in the world won't make you a better dancer - if you haven't got that little spark that lifts ordinary dancers above the others, then all the work-outs in the world won't improve your chances of elevating yourself in the art of Highland dancing. CELTIC WORLD: Over the years you have judged and danced with many greats. Have you a list of elite dancers, those whom you have thought are just that bit extra special? ALEX McGUIRE: During my competitive dancing career I've had the privilege of dancing alongside some of the dancing greats. Dancers like Charlie Mill, the great Victor Wesley, the inimitable Rosemary McGuire, Mharie Stronach, Jean Boyd, Kathleen Scott, Ann McIlroy, May G. Falconer, Sandra Adams and so on. In my very early days I recall Bobby Cuthbertson (probably the greatest dancer and character to light up the dancing world), Dave Beattie from Montrose, the Lowe brothers from Arbroath, etc. During my teen years there was Bobby Watson from Aberdeen and J.L. MacKenzie, also from the Granite City - all "characters" who went out to entertain week after week. It was a pleasure to rub shoulders with these giants of the Highland dancing world, all, without exception, "doing their own thing" in trying to catch the judges' eye with their little extras that everyone looked forward to seeing. Of course, "doing your own thing" today would be looked on as sacrilege, and if an SOBHD member tried to do what these greats did then they'd be banned from competing for a certain period of time! Is this the way to promote and encourage Highland dancing? Bring back the good old days of freedom. CELTIC WORLD: And what of the great masters of yesteryear, who should be elevated to some kind of peak status? ALEX McGUIRE: In the "good old days" when Highland dancing was mentioned we constantly talked of Watson, Cuthbertson, MacKenzie, etc. These greats are now long gone, but we still bring up their names in conversation, because they were the characters who lit up the dancing world with their individual interpretations and styles. Today, there are plenty of excellent dancers - but no characters. This is because today's dancers are all "brainwashed" to reach a certain level of excellence, and once they have that level they are unable to think for themselves and go beyond this limit - so they end up like the thousands of other replicas you see week in week out on today's dancing platforms. As I said, we are still talking about those dancing greats from yesteryear today - in some cases 50 years after they passed on. Can you imagine in 50 years' time who we will be talking about? You can bet it won't be any of today's exponents as there is absolutely no-one who springs to mind as a character - only flocks of sheep being penned-in by a dictatorial shepherd. CELTIC WORLD: Given a magic wand, is there anything you would change in the world of Highland dance, other than the obvious disparity between the various governing associations? 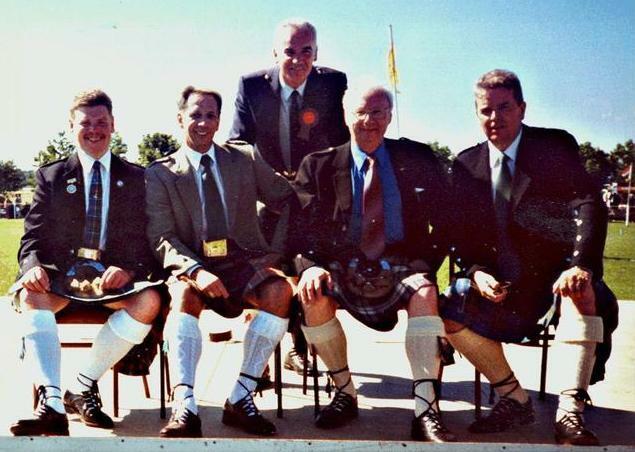 ALEX McGUIRE: For a long time I've dreamed about forming a "World Alliance of Highland Dancing Associations". I've mentioned this to our many overseas friends and they all have an open mind on the matter and would like to see it happen. The basic idea would be for each organisation to maintain their own dancing styles but amalgamate under the one banner. This, of course, would mean learning each others styles, but as the SOHDA has proved, in learning several styles, it can be done. The most important aspect of this Alliance is that there would be no "big chief" to dominate, as each "country" would take it in turn to organise their period of office. For example, let's say that Australia took over the reins for their occupancy of office (perhaps two or three years), then it would be up to them at the end of their tenancy to organise a "true" World Championship that would be open to all and not, as the so called World Championship is at the moment, only "confined" to dancers registered with the SOBHD. In truth it should be called the SOBHD World Championship as that is all it is. Do the SOBHD dancers realise only half the world can enter? Once Australia has had its "turn" as organisers, then they would pass on the reins to say, New Zealand or Scotland or Sweden, and it would be their turn to organise the proceedings, culminating in an open-to-all World Championship. There is obviously a lot of work to be considered, but it can be done. By learning each other's technique and styles, wouldn't we all increase our dancing knowledge and gain an understanding that would enhance greater appreciation of our ART? CELTIC WORLD: And finally, where do you see the positioning of the Highland dance world in another ten years time? ALEX McGUIRE: We have been hitting this brick wall for the last few decades and although the SOHDA and other open-minded organisations have all bent backwards to get round the table to iron out disagreements, the domineering attitude of the SOBHD has blocked all avenues of justice. They are the stumbling block in this jigsaw and until their attitude of supremacy alters then I don't see any chance of a change during the next ten years!! It's a sad situation, but it can all be settled with give and take by BOTH sides - not just ONE. Finally, many thanks indeed for allowing me the opportunity to speak my mind and answer your questions. It's nice to be able to pass on my thoughts and feelings on today's Highland dancing imbalances and perhaps it may hopefully inform your many readers as to the situation that is bringing our art to the sorry state it is in today. Bruce Campbell (Editor and coffee boy) Celtic World (incorporating Highland Gathering). The best selling Celtic cultural monthly. Postal address: PO Box 98, Corrimal NSW 2518 Street Address: Suites 4/5 108 Railway Street, Corrrimal NSW 2518 AUSTRALIA TEL 02 4285 7480 FAX 02 4285 7482 mobile 0415 647 423 Normal monthly Deadline: 15th of month prior to publication.